Successfully Added Wholesale Underwater Scuba Mask Camera (4GB) to your Shopping Cart. Have fun at the beach with this Scuba accessory that comes with a little twist. Built with a camera lens that lets you take photos and videos underwater, along with 4GB of internal storage. The CVMG-DV31 is a great novelty and is ideal for pools and shallow reefs where underwater visibility is very clear. This scuba gadget comes with a magnetic ring that acts as a shutter release. Located at the top side of the Scuba mask are the ON/OFF and Camera icons. - Brush the magnetic ring around the power icon, to power the camera ON. - To capture a photo, brush the magnetic ring on the camera icon for one second, you should feel the Scuba mask vibrate once, this means that you have successfully taken a photo. - To capture a video, brush the magnetic ring on the camera icon for 2 Mississippi seconds, when the scuba mask vibrates twice in a row, then this indicates that you have begun filming. The CVMG-DV31 is built with hard ABS, flexible high quality rubber, and tempered glass for excellent underwater vision. This really cool scuba gear accessory with a built in image and video camera is in stock now and available at the usual factory direct wholesale price from Chinavasion. Underwater camera with video recording option. Really cool gadget will make others at the beach jealous of you. Excellent novelty for children, get kids interested in marine biology and scuba diving at an early age. 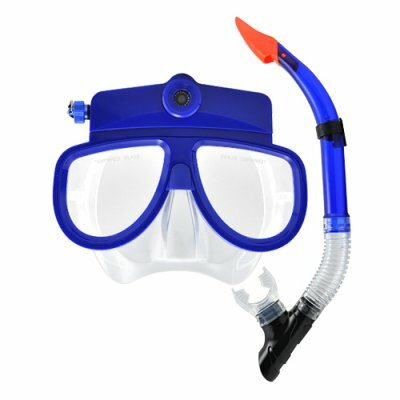 Can the memory on the scuba mask with video camera be expanded? The scuba mask with built in video camera comes with 4GB of internal storage, the memory cannot be expanded. Does the DV31 also record audio? Yes, the underwater scuba mask with built in video camera also records audio. I've never hear of an auto frames per second before, how can it be auto? Depending on lighting conditions, the video recording frame rate will slow down in low lighting conditions in order to capture as much detail as possible.